Today: Blustery! What is the true definition of that? I usually consider it when the wind comes in bursts, surges, and makes it feel colder. Today would fit. As temperatures struggle the reach 40F, it will feel like the 20s. How about the snow as well. Following a few streamers from Lake Erie down into Dixie is tough. I did mention it on the air yesterday, but did not want to push it too much. Unfortunately enough did fall to coast the ground in northern Baltimore County and Carroll County. The roads were salted this morning due to icy spots. These flurries and snow showers will continue until mid day, but be isolated. You can ABC2's StormCenter Doppler in my Weather Graphics Page. But that isn't really the story today is it? Tomorrow it will snow. For all of us. This is the model output for the NAM (North American Model), an upgrade from the former ETA, and has a tendency to overdue precipitation. I am using it, because the other images don't do a good job highlighting this clipper. 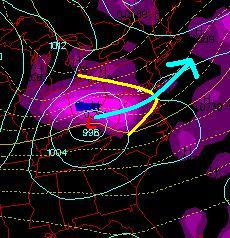 Two things to consider: First, when a clipper passes to our south, we often get the high end or more of snow. When it passes just north, we get much less or nothing. Second, there is cold air support for all snow. The general rule of thumb is 10 to 1. So multiply these numbers by 10 for an idea of snowfall. My general call is for 1-2 inches of snow. The timing will be afternoon through midnight. That means the evening commute could be slippery as roads tend to accumulate snow when the sun gets low between 3pm and 4pm. It should end overnight, but if we get wet afternoon roads to ice up, then Thursday may warrant a school delay. December 5th recent snow history and video of my LIVE coverage from WBAL tomorrow.